Around midnight on October 5, 1988, the commanders of Chile's air force, navy, and national police entered La Moneda. They had received a summons from General Pinochet, who had just lost a one-man presidential plebiscite, in which Chileans had been asked to approve an eight-year extension of his regime. But there had been no official announcement, and the partial returns broadcast on Chile's controlled television channels suggested that Pinochet was winning. The three military commanders did not believe these reports. Outside La Moneda, the streets of the Chilean capital were subdued and tense. Two buses belonging to the paramilitary police, the carabineros, were parked outside the palace and near the defense ministry one block away. Another carabinero bus was stationed near the headquarters of the Comando del No, a multipartisan coalition that had campaigned for a vote against Pinochet. Tear gas trucks had been positioned at major intersections, but there were few pedestrians, let alone demonstrators, anywhere to be seen. Leaders of the Comando del No had urged their supporters to vote, then to go home and stay indoors the rest of the day. The junta had serious misgivings about Pinochet as a presidential candidate, believing that a conservative civilian might have a better chance of winning. In the months leading up to the vote, Pinochet had traveled extensively up and down Chile's narrow territory, ostensibly on government business but actually to campaign for his own reelection, even before the junta had officially nominated him. His secret police, the Central Nacional de Informaciones (CNI), had even organized a political party, the Avanzada Nacional. The group attracted few adherents other than those with ties to the military, but they appeared wherever Pinochet did, cheering, waving Chilean flags, and holding up banners. And the country's state-controlled television stations were careful to avoid images filmed from a distance that might expose the limited extent of Avanzada Nacional's membership. During one such tour Pinochet claimed to have narrowly avoided an assassination plot when explosives were discovered at an airport where he was scheduled to land. He had canceled the visit the previous day, claiming he had a premonition that something was amiss, and the episode appeared to have been staged to boost his popularity. At times during his campaign Pinochet appeared in civilian dress, but he had no intention of ever giving up his role as head of the Chilean army. According to air force commander General Fernando Matthei, the junta members had insisted that if Pinochet was going to prolong his presidency for another eight years, he should do so as a civilian and retire from his post as army commander. It was their role to nominate the regime's candidate on August 30, 1988, and they informed Pinochet they would only do so if he agreed to this condition. The dictator seemed to agree, saying he would announce his departure from the army in a speech on September 11, the anniversary of the coup that brought the regime to power. But Pinochet's speech that day contained no such announcement. "That old gangster, he didn't say a word about this," Matthei said. And relations between Pinochet and the other service commanders cooled considerably in the weeks leading up to the vote, which Pinochet believed he would win. The Chilean economy had recovered from the severe slump it had suffered during the early 1980s, when low copper prices and high foreign debt gave way to mass protests against the regime. The country's gross internal product was growing by 7.3 percent that year, up from 6.6 percent the previous year, and most economic indicators seemed to augur well for Chile. Pollsters, however, were detecting a different mood. One conservative research group, the Centro de Estudios Públicos, had taken a poll in June of that year and found that only 14 percent of those surveyed described their economic situation as good, with 56 percent reporting it was average and 30 percent describing it as bad or very bad. A quarter of respondents said they were worse off than they had been a year earlier. And most important, only 33 percent said they would vote for Pinochet if he were the regime's candidate in the forthcoming plebiscite, while 37 percent said they would not. After seizing power in 1973, the regime had declared an indefinite "political recess," closing the Chilean congress and unleashing a campaign of arrest, torture, and imprisonment against the left-wing political groups supporting the Allende government. Thousands of Chileans sought political asylum abroad, fleeing to Europe, the United States, Canada, the Soviet Union, Australia, Cuba, Mexico, and Venezuela. The Christian Democrats, Chile's largest political party, also became a target of persecution, with some of its leaders forced into exile and at least one the victim of an assassination attempt in Rome. But Chile's political parties survived, with the help of their foreign counterparts, such as Europe's Socialist and Christian Democratic Parties. Within Chile, political party leaders often met under the cover of large social events, such as baptisms and weddings. Rafael Moreno, a Christian Democrat charged with clandestinely reorganizing his party in the mid-seventies, said that he and his colleagues quickly learned how to elude the security forces' surveillance and listening devices. "We had some of our best meetings in the bathroom, with the shower running," he recalled. The shared experience of persecution probably helped to ease long-standing rivalries and tensions among Chile's left and political center and to pave the way for the sixteen-party coalition that formed in early 1988 to campaign for a "no" vote in the regime's one-man presidential plebiscite. The coalition's ideological range extended from Salvador Allende's Socialist Party (which had split up into three differing factions) to the moderate wing of the National Party, which traditionally represented landowners and other conservatives. The bitter political disputes leading up to the 1973 military coup were now replaced by a well-organized, purposeful drive to bring democracy back to Chile. Led by Christian Democratic Party president Patricio Aylwin, the coalition began with a voter registration drive, followed by a grassroots campaign to urge voters to cast "no" ballots. Chile's electoral registry had been destroyed during the coup. The regime's two previous plebiscites-one in 1978 to support Pinochet in the wake of a United Nations condemnation of the regime's human rights record and another in 1980 to ratify the new, authoritarian constitution and to extend Pinochet's presidency for eight more years-had been held without lists of registered voters or electoral safeguards and, as was inevitable, showed a majority of votes cast in favor of the regime. But this third plebiscite would be different, with voter registration beginning several months earlier. Approximately 7.4 million Chileans, over 90 percent of eligible voters, had registered. Political parties could finally be officially recognized, if they gathered at least 33,500 signatures. And every political party was entitled to have observers at polling stations watching the voting and the counting of ballots. These provisions, along with the hundreds of foreign observers arriving in the country, convinced most political leaders that the voting process itself would be clean. But how would Pinochet react to an electoral defeat? There were fears that Pinochet might use any available pretext to overturn the plebiscite, including sabotage by his own security forces. Two weeks earlier the director of the CNI had met with the intelligence chiefs of the Chilean navy, air force, and carabineros. He described Pinochet's plan for the day of the plebiscite "in case something goes wrong." Between five and six in the afternoon the voting would be interrupted, all the country's television and radio stations would be connected to a government broadcasting system, and a state of siege would be declared. Upon hearing this news, air force commander General Fernando Matthei called his naval counterpart, who told him he had received the same report. The service commanders then requested a meeting with Pinochet. The meeting was held over lunch on September 27. The head of the carabinero police, General Rodolfo Stange, told Pinochet that the reports he had received showed that in several major Chilean cities, a majority of voters would be casting "no" ballots. Pinochet seemed surprised at this news and began taking notes and muttering that he was not going to leave. The other service commanders reminded him that the country's constitution must be respected, but then Pinochet repeated what the CNI director had previously stated: "If 'something goes wrong' he would give orders to send troops out into the streets, to set up a national broadcasting system, and request a state of siege.... Our reaction was silence." Five days before, the plebiscite leaders of Civitas, a nonpartisan voter education program, had met with the army general commanding Santiago's military zone to discuss security protection for their offices on voting day. General Jorge Zincke was initially cordial but then began warning the civic leaders about "a communist plot" to disrupt the voting process: there would be various types of explosions and other terrorist incidents, goon squads would attack polling sites, massive power outages would take place, and the army would use tear gas and rubber bullets to break up any crowds that failed to disperse. The army, Zinke said, did not have the manpower to protect electrical towers but did have candles and matches to allow the election boards to do their work. The general's relaxed demeanor convinced the Civitas leaders that he was actually talking about a Chilean army plan to sabotage the plebiscite, not a plan by communists. They reported their conversation with Zincke to U.S. ambassador Harry Barnes, who sent an urgent cable to the State Department saying the embassy "took this information extremely seriously and urge[d] Washington to do so as well." This incident, along with two suspicious blackouts, prompted the U.S. State Department to call a meeting with Chile's ambassador in Washington, D.C., and to issue a statement requesting that the vote be respected. Young campaigners for a "no" vote had reported numerous instances of police confiscating their identity cards, thus preventing them from voting, and a pile of around five hundred Chilean identity cards, torn into pieces, had been discovered in a hillside park in downtown Santiago. Opposition leaders had received reports that two carabinero buses had mysteriously disappeared from police installations, which looked like part of a plan to provoke disturbances in poor neighborhoods of Santiago. "We met with General Stange, who told us he had the same reports," recalled Ricardo Lagos, a socialist who would later become Chile's president in 2000. "He told us he had ordered that the roofs of all carabinero buses be painted with reflective paint, so as to be visible from the air. We never did find out exactly what was going on." On the eve of the vote, Pinochet invited the junta members back to La Moneda and showed them the vote tally computers installed in the palace basement. This system, an army colonel explained, would allow a rapid computation of voting returns as soon as they were reported, and he predicted that a likely outcome would be available as early as one hour after the first voting tables closed. The returns from every voting site would be monitored by officials, regime supporters, opposition activists, and hundreds of foreign observers throughout the country. The Comando del No and Chilean political parties would keep their own vote tally, but the only official returns would be announced from La Moneda. On the day of the plebiscite the offices of Generals Matthei and Stange and Admiral Jose Merino were connected with the computers in La Moneda's basement. The service commanders watched the returns come in and heard reports that the Comando del No was expecting a victory based on their own estimates, but then at 7:00 p.m. their connections were cut off without warning. Repeated phone calls to La Moneda yielded only vague or evasive answers even as the first official announcement on national television reported that with a miniscule fraction-0.36 percent-of the votes counted, Pinochet was ahead with 57 percent. Another bulletin was promised by 9:30 p.m., but this was delayed by an hour, causing speculation that officials were tinkering with the results. What had happened to the efficient computing system? At 10:30 p.m. the regime released a second set of very partial returns, showing Pinochet ahead by 51.3 percent. A government spokesman promised a third announcement within an hour, but as midnight approached, there were no more official bulletins. The regime, according to a cable sent by the U.S. embassy that evening, "is obviously sitting on the results and releasing them very slowly." Meanwhile, leaders at the Casa del Si, Pinochet's campaign headquarters, were asking that they be allowed to celebrate this "victory" with a public demonstration in the center of the capital, though a ban on mass gatherings was in effect. Such actions would invariably spark counter demonstrations from "no" vote supporters, lending the regime a convenient pretext for launching a crackdown and suspending the plebiscite. General Stange refused this request and threw a police cordon around a twenty-block area of downtown Santiago, blocking the entry of any vehicles. Carabineros also arrested a group of men wearing balaclava helmets, who turned out to be agents of the CNI, and refused to release them. The army general commanding the Santiago garrison also refused the Pinochet campaigners' request that the ban be lifted. Admiral Jose Merino was preparing to go home when the summons finally came from Pinochet. As the three service commanders arrived at the presidential palace, air force commander Matthei detoured away from his colleagues and did something that would forever earn him the opprobrium of Pinochet and his hard-line supporters. It was time to "pull out the detonators," as he later described situation. He approached a group of reporters standing in the palace's inner patio, waiting for news. "It looks to me like the 'no' won," Matthei told the press. "And we are going to analyze this now." As the journalists scrambled to report this official acknowledgment of the regime's loss, the junta members descended to Pinochet's bunker underneath the presidential palace. The dictator, dressed in a suit and tie, appeared calm, but his volcanic temper would soon manifest itself. He was accompanied by his interior minister and another army general who acted as chief of his cabinet. The interior minister opened the meeting by saying that the plebiscite showed that Pinochet was still the most important political figure in the country, with 43 percent of Chileans voting for him. The opposition, on the other hand, consisted of multiple parties and political leaders. Matthei sarcastically suggested opening a bottle of champagne to celebrate, and the interior minister fell silent. General Stange indicated that the regime should begin to make contacts with political opposition leaders and announce the free elections as stipulated in the constitution in the event of a plebiscite loss. Pinochet rejected this proposal, saying he was not going to leave and that if necessary he would fill the streets with troops and "sweep away the communists." He also threatened to fire "any general or admiral who speaks to the communists." An argument then ensued, with Generals Matthei and Stange and Admiral Merino insisting Pinochet had no power to undertake such actions. The discussion turned to the plebiscite's results, which had come as a deep shock to Pinochet, as he had been convinced by his sycophantic advisors that he would win. The service commanders suggested that it might be time for a cabinet change. Pinochet seemed to agree, and then asked the junta members to sign a document that contained the minutes of the meeting they had just completed. Surprised that such a written report had been produced so quickly, the junta members examined it carefully and saw that it was not a record of their meeting but a document granting Pinochet extended powers, including greater control over the navy, air force, and carabinero police. Matthei picked up the document and tore it up; the other commanders also refused to sign. And with that, the slow process of ending one of Latin America's longest dictatorships began, with Pinochet fighting a fierce rearguard action every step of the way. Many Chileans had gone to bed that night thinking that Pinochet would be declared the winner of the plebiscite, regardless of the vote count. The news that the dictator had lost and would be leaving the presidency after sixteen years seemed extraordinary. Small groups of onlookers began congregating near La Moneda, staring at the presidential palace almost in disbelief. By midday the crowds had grown to the thousands, filling the plaza and the surrounding streets in the center of Santiago. Rumors began to circulate: a helicopter was about to land on the roof of La Moneda to take Pinochet to safety; or Pinochet had already fled the country, possibly to Paraguay. The mood was calm, but the sheer number of people seemed to overwhelm the carabinero police. At one point an opposition politician, Alejandro Hales, approached one of the police vans and addressed the crowds on the loudspeaker, urging them to disperse. That evening Pinochet appeared on national television, dressed once again in his army uniform. He said that the plebiscite had not altered the existing order and that his regime's constitution would be upheld. He dropped from public view for a few days, spending time at the seaside before returning to Santiago. He held a luncheon with leaders from the Avanzada Nacional and spoke to a conference of military wives, comparing those who voted against him in the plebiscite with the biblical mob that preferred Barabbas to Jesus Christ. During this speech and others he would make in the coming months, Pinochet blamed his electoral defeat on the Soviet Union, the United States, Europe, and Cuba and other Latin American countries along with unnamed politicians "who sold their souls abroad." "The regime had no plan B," recalled Genaro Arriagada, a Christian Democrat and leader of the opposition Comando del No. Having convinced himself that he would win, either by electoral victory or military fiat, Pinochet was now casting about for a new strategy. According to the terms of the 1980 constitution, if the regime's single candidate were defeated in the plebiscite, free elections would be held the following year. "He was a very worried man about human rights," General Matthei said. "He tried to persuade us that we could never turn over the country to civilians because we would end up accused." On the other side of the Andes, his Argentine counterparts had been tried and sentenced for their part in the massive human rights abuses during that country's dirty war. Chile's victims were fewer in number, with those who disappeared or were killed perhaps a tenth of Argentina's thirty thousand desaparecidos. But Argentina's dirty war featured a rotating cast of generals; in Chile, Pinochet was very much the lead actor. And the United States was exerting renewed pressure to resolve the 1976 car bomb assassination in Washington, D.C., of Chilean exile leader Orlando Letelier and an American coworker. U.S. investigators had charged the regime's former security chief, retired general Manuel Contreras, and two other army officers with planning and organizing the killing; the regime's refusal to extradite them to stand trial had further worsened relations between the two countries. If Pinochet was "a very worried man," Contreras was even more so. He had been Pinochet's closest advisor and the man responsible for helping him consolidate power following the 1973 coup, moving him from junta member to supreme leader. In the wake of the Letelier case, Pinochet had removed Contreras and reorganized the security forces under a new name in 1978, but the former intelligence chief, who now ran a private security agency in Santiago, was still widely feared. In February 1989 Contreras, through intermediaries, approached the U.S. embassy in Santiago bearing a strange message. He claimed to have had four separate meetings with "gringos" prior to the October 5 plebiscite. As a result of these meetings, it was agreed that neither side would reveal any information damaging to Contreras himself, Pinochet, the U.S. government, former CIA director and then-presidential candidate George Bush, or then-ambassador Harry Barnes. The United States had broken this agreement with its recent initiatives on the Letelier case, and if a new understanding was not reached by the end of the month, Contreras would take unspecified actions against the United States. He indicated that he was prepared to give a sworn statement in Chile on the Letelier assassination, provided that he and U.S. representatives could agree on "an appropriate story" to explain the case, such as stating that the Chilean exile had been a pro-Castro Cuban agent, killed by Cuban exiles. As if to show he could still provide information of interest to U.S. officials, Contreras also indicated that one of his agents indicted by a U.S. grand jury in the case had been involved in drug trafficking with one of Pinochet's sons. Contreras's threat was reported in a cable written by embassy deputy chief of mission George Jones, who noted that the former security chief was "the most dangerous man in Chile" and that the possibility of a "a Contreras-initiated terrorist act" could not be excluded. While his former security chief was attempting to blackmail his way out of trouble, Pinochet returned to his support base, the Chilean army, visiting regiments around the country for five weeks. He then spent a week touring a part of southern Chile that had been one of only two regions in the country where a majority had cast "yes" votes in the plebiscite. Pinochet told supporters that his regime would provide the area with improved healthcare facilities as "a prize for patriotism" and that he would soon advise them who to vote for in the forthcoming presidential elections. He did not discount the possibility of running himself, which would have involved bending the rules of his own constitution. The regime's 1980 constitution envisioned a protected democracy for Chile, in which the armed forces would be given an explicit role as guarantors of the institutional order. One-third of the seats in Chile's new senate would be appointed by the government, making any future reforms difficult. Other authoritarian provisions included a ban on political party membership for labor leaders and a presidential prerogative to dissolve the lower house, the chamber of deputies. It is unclear whether Pinochet actually believed a rerun for the Chilean presidency was feasible; in any case, he wanted to avoid being viewed as a lame duck. Aside from a shrinking pool of die-hard supporters in the Avanzada Nacional, there was little backing for a Pinochet candidacy. Chile's other conservative and right-wing parties had supported a "yes" vote in the plebiscite on the grounds that this would ensure stability and continued economic growth. Like the junta members, most conservative leaders would have preferred the candidate in the regime's one-man election to have been a civilian, and discussions were already underway to select a candidate for president as well as candidates for seats in Chile's soon-to-be-reopened senate and chamber of deputies. On March 11, the date that began his final year as president, Pinochet gave a speech reversing his earlier, adamant pronouncements that there would be no tampering with his constitution. He said he had instructed his interior minister to hold discussions with Chile's political parties on possible modifications to the charter. He even went so far as to mention some reforms being considered, such as shortening the eight-year presidential term and eliminating the president's power to expel Chileans from the country. He also promised to boost spending on health care, housing, and education, without raising taxes, and urged the few thousand regime supporters "to prepare the way to defeat the rainbow," a reference to the opposition coalition's campaign symbol. The speech suggested that Pinochet would not seek reelection in the forthcoming election and was preparing the governmental apparatus to help a conservative candidate win the presidency. His hard-line backers were still making their presence felt within the regime-there had been some discussion of Pinochet's wife, Lucia Hiriart, running for president-but more pragmatic officials had managed to persuade him that a second defeat would be disastrous. Constitutional reform and increased social spending were likely to be major themes in the campaign, and what better way to steal some of the opposition's thunder than to take control of these issues first? If Pinochet appeared to be loosening his grip in some areas, he was tightening it in others. On March 21 he named a new head of the regime's constitutional tribunal, a seven-member body charged with interpreting the charter and approving new laws. Two more Pinochet loyalists were also appointed, one replacing a relatively independent jurist who had helped create the procedures for clean voting in the 1988 plebiscite. These appointments, according to one diplomat, effectively converted one of the more independent entities in the Chilean judicial system into "a mouthpiece for Pinochet." Two weeks later Pinochet gave another speech in which he said the military would remain the best defense against those seeking to return the country to the "pseudodemocracy" of the Allende years. This last remark prompted assertive criticisms from opposition leaders, with the Christian Democrats issuing a statement calling Pinochet's words "treasonous" and stating that they contradicted his own constitution. Renovación Nacional was a Center-Right party founded in 1987 that had reluctantly backed Pinochet's reelection in the plebiscite. The party had already begun talks with the opposition coalition to discuss constitutional reforms and the country's political future. Several leaders on both sides had known one another since their days in Chile's congress before the 1973 coup and had maintained informal contacts during the military regime. In what seemed a promising display of political cooperation, Renovación Nacional, opposition leaders, and the regime's civilian interior minister, Carlos Caceres, had worked out a proposal for constitutional reforms to be presented later that year to voters in a referendum. Pinochet's response to his minister's hard work was predictable. He rejected almost all of the suggested reforms, prompting Caceres to offer his resignation the following day. Two other cabinet officials offered-or threatened-to resign as well. On April 26 Pinochet requested the resignation of his entire cabinet, and that evening he held a previously scheduled meeting with members of the junta. The junta objected strenuously to Caceres's departure from the government and insisted that the process of constitutional reform continue. The meeting, according to General Matthei, soon deteriorated into a shouting match with Pinochet. "At one point he got up, causing his chair to fall over and, striking the table with his fist, shouted 'I am the only one to speak here. You have no right to say anything!'" Matthei said. Admiral Jose Merino shouted back at Pinochet, and the atmosphere became so tense that Matthei and two other service commanders walked out of the room, leaving the admiral and Pinochet still shouting at each other. The next day Pinochet announced that Caceres and all but one other minister would remain in their posts. Caceres later said that there had never been unanimous agreement within the government on the issue of constitutional reform and tried to downplay the cabinet crisis as a short-lived disagreement. But it was clear to most observers that once again the junta had forced Pinochet to back down. Trying to save face, Pinochet lashed out at Renovación Nacional, publicly criticizing the party for working "with political parties that join with Marxists." He also issued an unusual written statement accusing the opposition coalition of trying to drive a wedge between himself and the armed forces. Constitutional reform was going ahead, with or without Pinochet's backing, but the dictator found another way to help preserve his authoritarian legacy. On June 17 the regime published a new law offering a retirement bonus equivalent to US$43,000 to any Supreme Court judges over seventy-five if they would leave. Six judges promptly accepted the offer, while three others who were eligible-the only ones not appointed by Pinochet-did not. The jurists appointed to replace the retiring judges were all viewed as sympathetic to the regime and not noted for originality or independence. On July 30 Chilean voters went to the polls and approved, by 85.7 percent, a package of fifty-four constitutional reforms presented by the regime. The reforms were less than the original proposal worked out among Renovación Nacional, the opposition coalition, and Caceres but still represented a first, tentative step toward political liberalization: the reforms eliminated the president's right to dissolve the chamber of deputies and to send Chilean citizens into exile and limited the executive's powers under a state of emergency and a state of siege. It is likely that Pinochet and other regime hard-liners did not relish the prospect of an opposition civilian president having such powers. The presidential term was reduced from eight years to four, and an article used to ban Chile's Communist Party was replaced with one providing "norms which guarantee political pluralism." Pinochet appeared on television that evening, looking fit and healthy despite a recent hernia operation, and gave an address to the nation in which he interpreted the vote as ratification of his 1980 constitution. Of much greater interest to the Chilean public was the election campaign, the first democratic presidential race since 1970. The opposition coalition, now enlarged to seventeen parties, had become the Concertacion de Partidos para la Democracia and had nominated Christian Democratic president Patricio Aylwin as its candidate. The nomination had been expected, for Aylwin was not only president of the Christian Democrats, the largest of the Concertacion parties, but had been one of the most visible leaders of the Comando del No in the plebiscite. A moderate, old-fashioned politician, he had been a member of Chile's senate since 1965 and had served as its president from 1971 to 1972. The regime's candidate was its former finance minister Hernan Büchi, a man who had been a mining engineer but who also held an MBA from Columbia University in New York. At first glance, he seemed an odd choice for a conservative, right-wing campaign: at forty he was barely old enough to run for the office, and his long blond hair made him look more like a pop singer than a potential president. His favored mode of transport was a bicycle, and he was said to be separated from his wife and cohabiting with a girlfriend. The Concertacion had published a detailed, forty-eight-page policy document, which began with a list of further constitutional reforms, such as an elected (rather than appointed) congress and reigns on presidential control over the military. It pledged to fully investigate human rights violations since the 1973 coup and would support the Chilean courts in prosecuting the most egregious cases. The document also promised sound macroeconomic policies but indicated that the minimum wage would be increased and that a reform of the regime's labor code would give unions more bargaining rights. There were also detailed sections promoting stricter environmental policies, along with sections extending the rights of woman and Chile's indigenous minorities. The Chilean Right was suffering from serious internal divisions, as seen in its much shorter, sixteen-page program document. The economic section was more expansive than the Concertacion's and was difficult to reconcile with Büchi's reputation for careful fiscal management: there were promises of a million new jobs, better salaries and working conditions, a hundred thousand new housing units built each year, and access to private health care for all, with some subsidies to help the poor pay for treatment. There was a section on human rights containing a vague condemnation of violence. The UDI and Renovación Nacional had signed an electoral pact, Democracia y Progreso, but there were rivalries among their various senate and congressional candidates as well as a lack of consensus over how much distance to place between themselves and the Pinochet regime. The Aylwin campaign was already attacking Büchi as a continuation of the regime. Complicating matters further, another Chilean businessman, Francisco Errazurriz, had registered to run for president as an independent candidate. His candidacy was likely to siphon votes away from Büchi but not from Aylwin. Both candidates, to their credit, had filed full financial statements disclosing their holdings. Aylwin, who came from a family of prominent lawyers, turned out to own only one car; Büchi had investments worth around US$100,000 plus holdings in two small companies. Neither could reasonably accuse the other of ill-gotten gains. Aylwin had been acting like a presidential candidate months before he received the nomination. He had delivered an address on his coalition's economic and social programs to the U.S.-Chile Chamber of Commerce, a group largely supportive of the regime's economic policies. He said that the Americans there understood that economic freedom also required political freedom and that in economic terms Chile was divided into two countries: one whose people had incomes of between one and two thousand dollars per month and another whose people had incomes of between fifty to one hundred dollars per month. Although in the 1960s even the Chilean Right favored strong state participation in the economy, the world had changed and so had the opposition's thinking-the coalition believed that 90 percent of the economy should be in private hands. There would be more social spending and wealthy Chileans would have to pay higher taxes, but an Aylwin government would resist the kind of populist pressures that had undermined other Latin American countries. A question-and-answer session followed, with Aylwin referring some of the more technical queries on matters relating to foreign investment and taxes to an aide. Much of the reaction was critical, with some in attendance dismissing the economic proposals as old-fashioned, "soak the rich" rhetoric. Büchi's support from business groups did not seem to boost his confidence in other settings. His first official campaign appearance occurred in a small town in southern Chile where a majority of voters had backed Pinochet's reelection. A few days later he was photographed taking part in an equestrian show, winning an amateur jumping competition astride a horse named Oligarch. Büchi also gave a speech in a low-income area of Santiago but left almost immediately afterward, as if he wanted to avoid mingling with locals. Other events, such as a series of visits to factories, received little publicity, and his campaign did not always inform the press of his plans. The polls showed Aylwin enjoying a healthy lead, with one conservative research group reporting Aylwin ahead 51.6 percent to Büchi's 35.8 percent in October. An even higher percentage of respondents-60 percent-believed that Aylwin would win the forthcoming election. Even Pinochet seemed to think the opposition victory was inevitable, and it appears he was spending most of this period devising ways to protect himself and the military under a future opposition government. On the anniversary of his promotion to army commander sixteen years earlier, Pinochet delivered a hard-line speech stating that the armed forces were standing by to "rescue Chile" if the situation warranted. He warned against any tampering with a 1978 amnesty for human rights abuses his regime had imposed and indicated that service commanders could not be removed from their posts by a future president. The military would determine its own budget and system for promoting officers; these provisions were nonnegotiable, he said. Several weeks later Pinochet presented a new law to the junta that would create a military council to preside over the armed forces and take charge of all dealings with the executive branch. The proposed law effectively sought to construct an additional barrier between civilian and military authority, with the commanders of the different armed services reporting to this new council rather than directly to the Defense Ministry. "He wanted to establish a kind of parallel military government," General Matthei recalled. The Chilean navy and army were willing to go along with the measure, which required unanimous approval by the junta. Another thorny issue for Pinochet was what to do with his security forces. Matthei said the air force's chief accountant had come to him with the news that the service's budget had been unexpectedly increased. At a subsequent junta meeting Pinochet informed the service commanders that he needed to redistribute CNI officials and employees among the different branches of the armed forces-hence the budget increases. The Chilean air force was to incorporate about three hundred individuals, some military officers and some civilians, into its ranks. "Obviously, I got angry and told the president there was no way we were going to take charge of these people or these funds and that I was returning the extra budget monies assigned to me," he said. Matthei was irritated that the proposal had been presented as a done deal, as had so many of Pinochet's past schemes. The dictator later requested a meeting with the air force commander, which took place at a military club near an army base in Santiago's southeastern outskirts. Pinochet "said that we had to face the eventual human rights problems together, and that each one of us had to do his part," Matthei stated. Matthei had assumed command of the air force in 1978, when Pinochet had forced the removal of his predecessor, who had argued for an earlier transition to democracy. Eighteen other air force generals had resigned in support of their commander, leaving only Matthei and one other general. As commander, Matthei had successfully weeded out air force officials or employees working for the security forces and informed Pinochet that he was unwilling to reverse this policy. Pinochet moved much of the CNI into an army intelligence unit, and his defense minister said the former security forces' files would all be destroyed before the new president took office. However, the CNI had one last operation to perform. On the evening of September 4, 1989, Jecar Neghme, a twenty-nine-year-old spokesman for the moderate wing of the Movement of the Revolutionary Left (MIR), was shot dead as he left the organization's offices in Santiago. The MIR was founded in the 1960s out of university student groups and was a principal target of the regime's security forces. A few days earlier Neghme had spoken at a MIR rally in support of Aylwin's candidacy (though the MIR, like the Chilean Communist Party, was not part of the opposition coalition). "Pinochet cannot ignore us, we have survived, we are not dead," he told the crowd. Perhaps the CNI interpreted Neghme's remarks as a provocation, but whatever the motive, his was the regime's last killing. More than sixteen years later a judge would charge six former CNI agents in the killing; all but one confessed to involvement. According to an attorney representing the victim's family, the decision to kill Neghme was made to spend unused "special projects" funds before the agency was disbanded. On September 11, the sixteenth anniversary of the coup that brought his regime to power, Pinochet gave an emotive ninety-minute farewell speech. He listed his regime's accomplishments in such areas as road and bridge building, mining production, and the reduction of infant mortality rates and lashed out at "those looking for money and foreign philosophies abroad." He also announced a 12 percent pay increase for government employees. Choking back tears, he said he "loved Chile more than his own life." It was not, however, Pinochet's farewell to the Chilean army. Over the years he had increased the number of generals, bringing their total the previous year to fifty-six. This gave Chile a ratio of almost one general to every thousand soldiers, or double the U.S. equivalent. On October 9 he announced new promotions and appointments, retiring twelve generals but appointing another seven. He also replaced his vice commander, General Jorge Zincke, with another general. Zincke was well respected among his fellow officers but had shown perhaps too much independence when he refused the Pinochet campaign's request to allow a premature celebration in the streets of Santiago the night of the plebiscite. He was also said to have a plan to purge the more notorious human rights abusers before a new civilian president took office in March. Zincke expected there would be human rights trials in the future and wanted to lessen the army's involvement. Pinochet was having none of this. A few days after the new appointments, he made another visit to southern Chile, where he gave a speech warning that the armed forces would never "allow any of their members to be vilified and humiliated for their actions aimed at saving Chile" and said he would remain as army commander to protect his officers. "The day they touch any of my men will be the end of the state of law," he said. Aylwin's reply to Pinochet's threat seemed like that of a patient adult dealing with an ill-behaved child. "What is one to understand by touching a man? Is it to apply the law and justice?" he asked. "I believe that phrase was an unfortunate one pronounced by this gentleman in an outburst, without really thinking." Were he to take Pinochet's statement seriously, it would constitute sedition, a punishable offense. On November 13 Pinochet held a luncheon for right-wing political leaders where he suggested that army headquarters might be moved to Iquique, a port city in northern Chile. Any dealings with the future civilian president could be handled in Santiago by Pinochet's vice commander. He also indicated that he expected Aylwin to win the election, even as some right-wing leaders were hoping that businessman Francisco Errazurriz's candidacy would result in a second round between the opposition leader and Büchi. The polls continued to give Aylwin a commanding lead, and his team was making plans for his future government as well as conducting informal discussions with Renovación Nacional politicians on how constitutional reform might be continued. Aylwin presented himself as a bridge builder, at one point appearing onstage with the daughter of the late socialist president Salvador Allende and a politician from the most conservative wing of the opposition coalition. Privately, some coalition leaders were worried that Aylwin could be the target of an assassination attempt by right-wing hard-liners. Should this occur in the eight days leading up to the election, the coalition would be prevented by law from running another presidential candidate, leaving voters with a choice between Büchi and Errazurriz. On December 14, 1989, over seven million Chileans took part in the first presidential election to be held in nearly two decades. It was also an election for the country's new congress, composed of thirty-eight elected senators (plus nine appointed senators) and one hundred twenty members of the chamber of deputies. There were fifteen officially registered political parties, with another twelve with applications pending, a remarkable situation when one considers that the regime's constitution demanded that each party gather at least 33,500 signatures from voters unaffiliated with any other political group. The voting process went smoothly, and there were no suspicious delays in announcing the results. The first returns were reported at 7:30 p.m., showing Aylwin clearly ahead, and there was a definitive announcement by Interior Minister Carlos Caceres shortly before midnight that recognized the Christian Democrat as Chile's president-elect. Nearly two hours earlier Büchi made a gracious concession speech in which he promised to "maintain constructive criticism" of the new civilian government, and then he proceeded to Aylwin's campaign headquarters to present his congratulations. Independent candidate Francisco Errazurriz followed suit. The final returns showed Aylwin with 55 percent of the vote, Büchi with 29 percent, and Errazurriz with 15 percent. In a brief address to his supporters, Aylwin promised to be president "of all Chileans." The election itself had been peaceful, and most Chileans turned their attention to Christmas and the southern hemisphere summer ahead. But Chile's angry, disaffected youths made their presence felt in the election aftermath. By late afternoon there were scattered clashes between the carabinero police and groups of rock-throwing youths, some wearing emblems of the Far-Left. At one point the demonstrators blocked Santiago's main avenue for an hour and were eventually dispersed with tear gas and water cannons. And in the coastal resort city of Vina del Mar, similar groups of youths attacked what they charged was a building belonging to the CNI. The violence was easily contained but was still a worrying taste of what Aylwin would have to confront in the near future. He spent much of that day at his campaign headquarters in Santiago's San Francisco Hotel, receiving international delegations, journalists, and diplomats. U.S. ambassador Charles Gillespie was among the visitors. "He's a good, decent man who clearly senses the heavy responsibilities he now faces," Gillespie wrote in a cable to Washington, D.C., following their meeting. "He shows every sign of having the qualities necessary to guide this country through the difficult times ahead. Certainly the majority of Chileans think so." 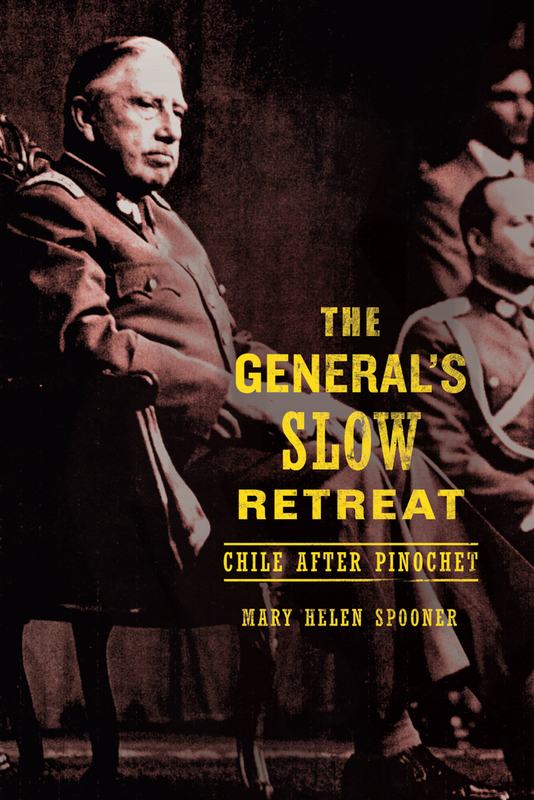 In her acclaimed book Soldiers in a Narrow Land, Mary Helen Spooner took us inside the brutal dictatorship of Augusto Pinochet. Carrying Chile’s story up to the present, she now offers this vivid account of how Chile rebuilt its democracy after 17 years of military rule—with the former dictator watching, and waiting, from the sidelines. Spooner discusses the major players, events, and institutions in Chile’s recent political history, delving into such topics as the environmental situation, the economy, and the election of Michelle Bachelet. Throughout, she examines Pinochet’s continuing influence on public life as she tells how he grudgingly ceded power, successfully fought investigations into his human rights record and finances, kept command of the army for eight years after leaving the presidency, was detained on human rights charges, and died without being convicted of any of the many serious crimes of which he was accused. Chile has now become one of South America’s greatest economic and political successes, but as we find in The General’s Slow Retreat, it remains a country burdened with a painful past. Mary Helen Spooner is a journalist who began working in Latin America in 1977, including nine years as a foreign correspondent in Chile. She has reported for ABC News, The Economist, The Financial Times of London, and Newsweek. She is the author of Soldiers in a Narrow Land: The Pinochet Regime in Chile, Updated Edition (UC Press).